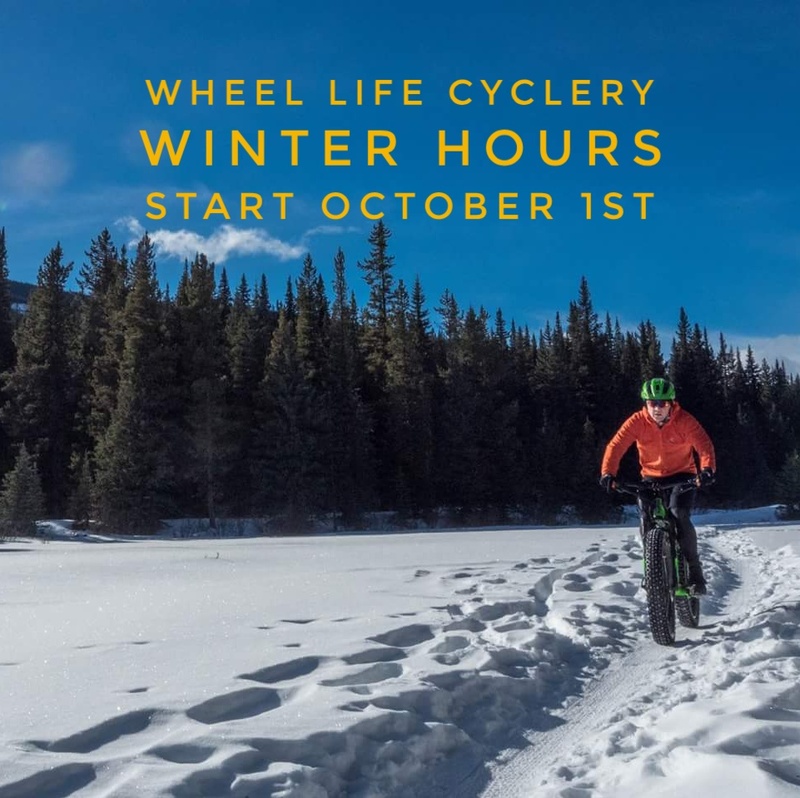 Please note that Wheel Life Cyclery will be closed for a seasonal break from December 23rd, 2018 thru January 7th 2019. The shop will re-open on Tuesday January 8th. December 20, 2018 by Christopher Brown. WINTER HOURS Start October 1st! October 2, 2018 by Christopher Brown. One more sleep and our Third Annual GARAGE SALE is live! There will be a small selection of used/staff/demo bikes for sale! Lots of special pricing on one-off items! Doors open Saturday at 9am and deals will run all weekend! September 14, 2018 by Christopher Brown. Wheel Life Cyclery will be extending our hours for Saturday September 15th (9am-6pm) and Sunday the 16th (9am-5pm), for our third annual "Garage Sale" event! This sale will see us once again spill out of the shop limits, and will feature discounts on every item in store. There will be bikes, framesets, forks, accessories, parts, shoes and clothing, and maybe even some coffee and donuts if you're there early enough. There will be lots of special deals, one off items, random stuff pulled out from dusty boxes, mystery items, smiles, and probably a ton of other stuff we've forgotten to write down. Details of the sale will be announced Friday September 14th..... Keep your eye's peeled for what will be some of the best deals of 2018! Rocky Mountain, Kona, Salsa, Surly, Spot and SE Bikes marked down! Discounts apply to select bikes only. See below for a detailed list of bikes available including Category, Year, Make, Model, Size and Color. Come on in during our NEW hours before these roll out of the shop! To make sure we still have what you want, please give us a call at (403) 938-7018. April 7, 2018 by Christopher Brown. Even though mother nature may not agree, spring has arrived, so we have decided to modify our hours to reflect longer days of sunlight, and more opportunities to make sure you are ready for your next cycle adventure. Please come and see us at 27 McRae Street during our new hours effective April 2nd 2018. March 31, 2018 by Christopher Brown. Well, it has been a long time coming, and while the shop is not 100% set-up yet (maybe 67%? ), we're cleared to be back open. As such, the doors shall become unlocked as of Tuesday February 13th. February 10, 2018 by Christopher Brown. Unit B1 #27 McRae Street, Okotoks, Alberta..... Opening Soon! It's been a busy few weeks behind the scenes here at Wheel Life Cyclery, but we're working hard to get the shop re-opened ASAP. Remember to keep checking back here, and to follow us on Facebook and Instagram for more updates. January 11, 2018 by Christopher Brown. That's right, Wheel Life Cyclery is proud to announce that we will be moving to a fantastic new location (yes, still in Okotoks) in early 2018. The shop will be open for regular business hours up to and including Saturday December 23rd, at which point we will be closing the doors at #1-115 Fisher Street, and reopening them in early 2018 in the new location at 27 McRae Street. Keep your eyes open for more posts, information, and exciting things coming soon! December 6, 2017 by Christopher Brown. Wheel Life Cyclery will be extending our hours for Saturday October 28th (9am-5pm) and Sunday the 29th (10am-2pm), for our second annual "Garage Sale" event! This sale will see us once again spill out of the shop limits, and will feature discounts on every item in store. There will be bikes, framesets, forks, accessories, parts, shoes and clothing, and maybe even some donuts if you're there early enough. Come join us for our biggest sale event of the year! October 4, 2017 by Christopher Brown. Rocky Mountain Bicycles + WLC!!! Wheel Life Cyclery is proud to announce that we have added ROCKY MOUNTAIN BICYCLES to our brand line up! August 23, 2017 by Christopher Brown. That's right, in the spirit of the upcoming cyclocross season, WLC will be slashing the prices on all in store drop bar bikes until the end of September! Cyclocross, Road, Touring.......if the bars drop, so does the price! August 17, 2017 by Christopher Brown. That's right, WLC will be launching a ShockWiz Rental Program in early-mid August. We'll have a few different rates and options, so come on down to the shop or drop us a line if you have any questions or if you're interested in getting your suspension set-up dialed. That's right, we're doing a Canada Day Sale!!! On July 1st, WLC will be doing 15% off all in store Cruiser, Townie, Single Speed, Hybrid, Touring, Road, and Cyclocross bikes! June 30, 2017 by Christopher Brown. Wheel Life Cyclery is excited to announce that we are adding FROG BIKES to our shop line up! Based out of the UK, this premium brand focuses exclusively on lightweight kids bikes, and will make a fantastic (and colorful!) addition to our shop. We'll be placing our first order in early July, so be sure to let us know if there is anything you're after! June 28, 2017 by Christopher Brown. The SUPPORT LOCAL FITNESS AND FUN SALE!!! Looking to pick up a new ride this Spring but having a hard time saving up a big chunk of pocket change? Wheel Life Cyclery has paired up with Financeit to offer short and long-term financing on all bikes! April 18, 2017 by Christopher Brown. "Introduction to Mountain Biking" Classes! Wheel Life Cyclery is proud to announce that we have paired up with ZerkaDO Fitness (https://www.zerkadofitness.com/) to help launch a series of beginner level mountain biking courses! There will be a female specific version of the two-day course (July 8th-9th, 2017), as well as a Co-Ed course (July 22nd-23rd, 2017). Both courses will feature a day of theory and hands-on practice (basic bike fit, skills, and maintenance), and on the second day, a guided trip out on the trails. Both days will contain reasonable amounts of physical activity, the emphasis is really on just getting out, learning new skills, becoming more comfortable on your bike, and most importantly, having fun! Our goal is that everyone smiles so much that their cheeks will be the muscles that ache the most! Instruction, review, and guidance will be provided by PMBIA certified instructors and Wheel Life Cyclery staff. Check out the ZerkaDO Fitness website, their Facebook page, or contact Wheel Life Cyclery for more information! Exciting stuff this week down at Wheel Life Cyclery! Not only do we now have the amazing 2018 Salsa Deadwood in stock, but we were also able to get our hands on some of the legendary and elusive 2016 Salsa Deadwood framesets! Steel or carbon.....rigid or full suspension....Wheel Life Cyclery and Salsa have you covered for your 29+ cycling adventures! February 28, 2017 by Christopher Brown. 2017 Salsa Bikes In Stock!!! Things just got a lot more spicy down at Wheel Life Cyclery, thanks to a shipment of delicious Salsa! That's right, we just got in more of the extra hot 2017 bikes. Woodsmoke, Fargo, Mukluk, Beargrease, and Timberjack..........oh so tasty! January 24, 2017 by Christopher Brown.